The Municipality of Dimiao was founded on January 22 1769. 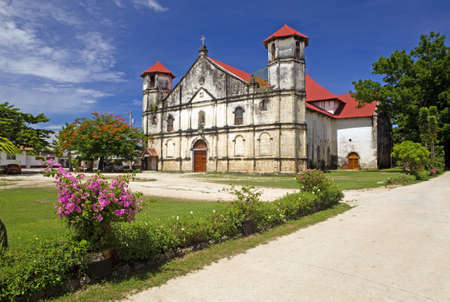 It has a unique history that is rich in religious tradition and culture manifested by the 17th Century Church and the mysterious Ermita Ruins. Way back the late 1600â€™s, the neighboring towns of Lila and Valencia were used to be part of Dimiao for the Church of Dimiao was a major seat of religious authority which was also very influential to the civil government. It was noted accordingly that Dimiao and Loay were used to be part of Loboc which was then the center of Spanish Authority. Thus, it was said that a big fortress used to stand Dimiao as an extension of the Spanish occupation wherein the Ermita Ruins is a part of. After some time, Dimiao and Loay separated from Loboc, and then later Lila and Valencia separated from Dimiao. The presence of the Spanish occupation is so evident in the zoning structures of the old buildings which are all suggestive of the Spanish royal coat of arms. As mentioned earlier, a 17th century Stone Church stood in Dimiao, which is now serving as the townâ€™s Cultural Center. Todayâ€™s Rural Health Center was another stone building during the said period. Fr. Leon M. Inchausti and Fr. Jose M. Rada of the Order of the Augustinian Recollects (OAR), who were recently beatified priests by Pope John Paul II, were once assigned in the Parish of St. Nicholas de Tolentino of Dimiao, Bohol in the early 1700â€™s. The two were among the eight Martyrs of Motril who surrendered their lives for the Love of God. For such reason, Dimiao is proud to be part of the stories of these holy men. It is hoped that both of them will soon be sanctified as Saints of the Holy Church and that the seed of vocation which they sowed in the town may prosper and grow with the blessings of the Almighty. he he he, interesting diay noh? Dimiao is the mother of Valencia and Lila. Aww, naa diay common historical bond aning tulo nga towns. Bitaw, I never knew that both Blessed Fr. Leon Inchausti and Fr. Jose Rada both served in Dimiao. Very beautiful religious history of this very old town. Who was Blessed Fr. Leon Ichausti? He was born June 28, 1859 in Ajanguiz, Vizcaya, Espana. His father was Benito Inchausti and his mother was Juana Mentiguia. He studied at the College of Philosophy and Sciences at Monteagudo at Navarri. His formation in Theology took place in Millan de la Cogolla in Rioja. He entered the Convent in Marcela, Navarri. On June 1, 1884, he traveled from Barcelona, riding in the ship Isla de Cebu for 1 month, to the Philippines. He landed in Cebu. Padre Inchausti was ordained in Cebu on December 22, 1884 after learning Cebuano. He became a parish priest in Dimiao, Bohol. He first set foot in Banton in 1887 visiting the parish priest, Padre Sanvallo Majuelo. After a short vacation in Banton, he went back to Old Sierra Vullones in Spain on Feb 26, 1888. When he returned to the Philippines, he again became parish priest in Dimiao, Bohol until he transferred to Romblon where he served as parish priest at Azagra, San Fernando, Sibuyan Island. He became a parish priest at Banton, Romblon from 1894 -1897. This was his last parish in the Philippines before he was transferred to Brazil. After 18 years as parish priest in Brazil, he went back to Spain to serve in his hometown. He did not realize then that he was going to be punished in his hometown. During the Spanish civil war in 1936, celebrating mass was forbidden in churches and monasteries. Nevertheless, Padre Inchausti and some other priests were not afraid to continue saying mass. Because of the disobedience of the priests, the soldiers burnt the monasteries and hundreds died, including Padre Leon Inchausti and seven other priests. The priests were all killed by a firing squad in a street in Montreal, Espana. After many years of studying the lives of the priests massacred in Montreal, the researchers concluded that they died in defense of their faith and for Jesus Christ. The seven priests were beatified on March 7, 1999 at the St. Peter's Basilica in Rome by Pope John Paul II. Now there is a move to build a statue of Blessed Inchausti in the church in Banton, Romblon. Before he can become a saint, he has to have two miracles attributed to him. Fr. Leon Inchausti is on the far right. He is portrayed here with the rest of the Martyrs of Motril. and in obedience to the Church. and ever grow in your love. "Whoever drinks of this water that I shall give him will never thirst" (John 4:14). Today, on the Third Sunday of Lent, Jesus' meeting with the Samaritan woman at Jacob's well is an extraordinary catechesis on faith. To catechumens preparing to receive Baptism and to all believers on their way to Easter, today the Gospel shows us the "living water" of the Holy Spirit, who regenerates man from within, causing him to be reborn to new life "from on high". Human life is an "exodus" from slavery to the promised land, from death to life. In this journey we sometimes experience the aridity and fatigue of life: poverty, loneliness, the loss of meaning and hope, to the point that we can even wonder, as the Jews did on their journey: "Is the Lord among us or not?" (Ex 17:7). That Samaritan woman, so tried by life, must have frequently thought: "Where is the Lord?". Until one day she meets a man who reveals the whole truth to her, a woman and even more a Samaritan, in other words, doubly despised. In a simple conversation he offers her the gift of God: the Holy Spirit, a spring of living water welling up to eternal life. He reveals himself to her as the awaited Messiah and tells her of the Father who wants to be worshiped in spirit and truth. The saints are "true worshipers of the Father": men and women who, like the Samaritan woman, have met Christ and through him discovered the meaning of life. They have experienced firsthand what the Apostle Paul says in the second reading: "God's love has been poured into our hearts through the Holy Spirit who has been given to us" (Rom 5:5). The grace of Baptism also came to fruition in the new blesseds. They drank from the fountain of Christ's love to the point that they were deeply transformed and in turn became overflowing springs to quench the thirst of the many brothers and sisters they met on life's path. "Since we are justified by faith, we have peace with God ... and we rejoice in our hope of sharing the glory of God" (Rom 5:1-2). Today, in beatifying the martyrs of Motril, the Church puts these words of St Paul on her lips. In fact, Vicente Soler, his six Augustinian Recollect companions and the diocesan priest, Manuel MartÃ­n, obtained access to "the glory of the sons of God" by the heroic witness of their faith. They did not die for an ideology but freely gave their lives for the One who had first died for them. They offered Christ the gift they had received from him. By faith these simple men of peace, who had nothing to do with the political debate, worked for years in mission territories, suffered a multitude of hardships in the Philippines, soaked the fields of Brazil, Argentina and Venezuela with their sweat, and started social and educational programs in Motril and other parts of Spain. When the supreme moment of martyrdom came, by faith they could face death serenely, comforting the other condemned men and forgiving their executioners. "How can this be? ", we ask ourselves, and St Augustine answers: "Because he who reigns in heaven governs the mind and tongue of his martyrs, and through them he has triumphed on earth" (Sermon 329, 1-2). Blessed are you, martyrs of Christ! May everyone rejoice over the honor paid to these witnesses of the faith. God helped them in their tribulations and gave them the crown of victory. May they help those who are working today for reconciliation and peace in Spain and in the world! Dear brothers and sisters, let us thank God for the gift of these new blesseds! Despite the trials of life, they did not harden their hearts, but listened to the voice of the Lord, and the Holy Spirit filled them with the love of God. Thus they could experience that "hope does not disappoint" (Rom 5:5). They were like trees planted by streams of water, which yielded abundant fruit in due season (cf. Ps 1:3). For this reason, the whole Church today marvels at their witness and acclaims: Lord, you are truly the Savior of the world; you are the rock from which flows living water for humanity's thirst! Lord, give us this water always, so that we may know the Father and adore him in Spirit and Truth. Amen! I consider that the sufferings of this present time are as nothing compared with the glory to be revealed for us. What will separate us from the love of Christ? Will anguish, or distress, or persecution, or famine, or nakedness, or peril, or the sword? No, in all these things we conquer overwhelmingly through him who loved us. For I am convinced that neither death, nor life, nor angels, nor principalities, nor present things, nor future things, nor powers, nor height, nor depth, nor any other creature will be able to separate us from the love of God in Christ Jesus our Lord. --for your reward will be great in heaven. But even if you should suffer because of righteousness, blessed are you. --Rejoice and be glad, for your reward will be great in heaven. Salamat, Bay Rogamz. Ganahan ko ani nga angle sa pic sa simbahan sa Dimyaw (courtesy of http://us.123rf.com/) kay tigtambay ko dinhi sa gamay pa ko. Makapahinumdom ni nako sa akong hugot nga pagtuo ug pagsalig sa Ginoo.